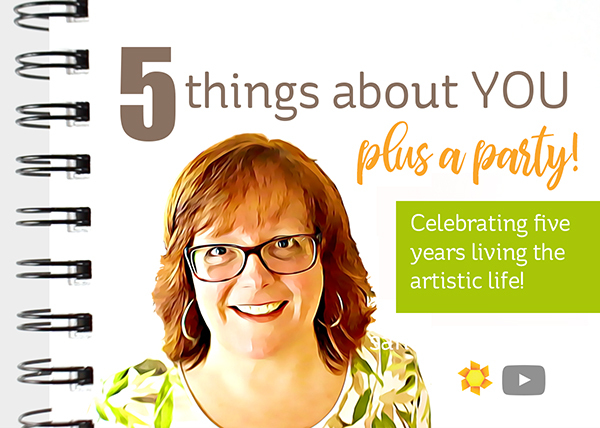 Five things about you … and a PARTY! Hello friends! I’m comin’ atcha with something a little different today…a PARTAY! It was five years ago this month that I left the 9 to 5 to pursue my passion as an artist. I still can’t believe it….I’ve made it past the point many small businesses fail, and I’m still here! THANK YOU for your part in making this an amazing journey!! to the hex chart lovers who use it and tell all their friends how helpful it is…. to the phenomenal family of patrons who donate a little or a lot to keep things afloat around here…. you are all AMAZING. Thank you! I definitely couldn’t have succeeded this far without any of you, and I’m completely humbled by your support! I’ve made this new little intro video for my YouTube channel, as a thanks to you all and a hope to inspire more people along their journey as artists too….watch it below or click HERE to see it on YouTube. Book launch on October 23, 2018! Read more about it on the website HERE. More awesome classes, including a Watercolor Jumpstart, Typography for Bible Journalers, and I think an advanced Copic Glassware class—all coming this fall, if I can get on it! Because, #3. A re-launch of art-classes.com in a more functional form! lol. It had some issues due to how the original site was constructed and the plugin developer’s issues, so I’ve hired an agency to overhaul it and make it work right. I’m taking a huuuuuge risk with making such a big investment, but I feel so badly about the tech issues that have developed. This should help us all! Once it’s done by the end of September or so, the classes listed in #2 will hopefully launch. Trying to juggle it all before #1 takes over, too! FIVE randomly drawn winners will get the class of their choice at art-classes.com! FIVE randomly drawn winners will receive a medium flat rate box of mojo in the mail – stamps and dies and goodies all wrapped in all the mental mojo I can scoop up from my studio! FIVE randomly drawn winners will receive one of my crazybackground cards! Leave a REVIEW on any courses you’ve taken at art-classes.com. Somehow the review tab got removed (AGH!) and it would help me tons if you left some comments! Be sure they’re about the courses, not the site goobers; those will go away and I’d like to give encouragement to others about what you’ve learned – and that they can learn too. Leave a COMMENT on YouTube on the video above. Wow – a book coming out, so cool! Came here to comment first but heading back over to check out the You Tube link and the book link…I’m in awe of your coloring skills and hoping to get to take one of your classes this fall! Congratulations on making it thru the 5-year mark, that’s awesome Sandy! You are so incredibly amazing and inspirational, Sandy! I use my hexchart every time I reach for Copics and I wouldn’t want to be without it. Even if it’s too late to be entered into the giveaway draw, I wanted to say hi and thanks for all you do for the crafty community! You are a rock star!! Congratulations Sandy! So glad you can do what you love and share with us your talents. Blessings! I have been a subscriber for ages and I am gonna stay for mamy more! Thank you!! I love your videos! I’m definitely going to take your beginner Copic course and then work my way through all of the other Copic classes. I’d looove a beginners watercolor class! So excited for that! I have been watching and learning from your videos for I guess is around 5 years now. I have not taken a class yet but I will be soon. Thank you for all you do and all the inspiration you give to so many! I haven’t taken any of your classes yet but I watch your you tube videos. I absolutely love everything you create. The 31 watercolors in July actually brought me to happy tears as I watched in amazement. Like you said we all have some type of talent but God gave you an extra dose! I have learned so much from watching your videos’ on You Tube. Thank you so much for all you do in the coloring community. It’s kinda like a birthday, right ? I’m so happy for you, you deserve all what’s coming to you. Thanks for sharing your wonderful artwork and talent, and of course your knowledge. I’m wishing you the very best for many years to come. G’day Sandy, it has been quite a lot of fun and a little wish fulfilment in the form of art attempts, lol, since I found and regularly binge out on your YT vids a couple of months back, so thanks. Congratulations on a courageous move 5 years back, and on your success. You are a blessing to “know” and I look forward to your book, although I struggle to write in the edges of a bible, let alone draw! Congratulations on five years Sandy! Since I just found you on YouTube earlier today and just learned of your giveaway a few minutes ago, I’m unable to say anything about a Review unfortunately since I have not yet taken one of your classes. However, I can post here and I will post to your YouTube video that I did watch a little while ago. Loving your website and will be looking into it further along with classes that you offer. Again, congrats!! Congrats Sandy on reaching 5 years! Wishing you many more. Congratulations! Way to go so exciting that you’ve done this and how much you’ve improved the last five years. I’ve loved watching your videos and learning from you the past three (the time I’ve been paper crafting. ) Thank you for sharing your amazing techniques and inspiring others. Looking forward to learning from you for many more! You have made it five years because you are so talented. Everyone knows your name and fame. Lov your work, always. Wish for some of that talent. So many amazing things you have going! Congratulations on all your successes and best wishes for all of your endeavors! Sandy, Thank you, thank you, thank you, for inspiring me to create. For edifing in a loving christian manner on your bible journaling. For teaching the concepts of water coloring which i love. For sharing your furry kids! (I have two). You my friend are amazing. Stay salty my friend! Congratulations on the upcoming book launch. You are amazing and such an inspiration to all. Sandy you are an amazing lady with a very kind heart. Congrats on 5 great years!! I can’t tell you how much I have learned since discovering you and your wonderful blog. You are such an inspiration to me and to so many others. You are sweet & real. Thanks so much for sharing your art and art lessons. Wow-your portraits for the we lost this past week, are absolutely stunning! What a tribute to them both. Congrats on five years of following your passion and trusting God’s leading to pursue your dream. I remember when you took the big step and God continues to bless me through you and your artistic gift. Thanks for the giveaway, too. Celebrating with you! Got a little teary watching and listening to your video. Thank you for sharing. It is obvious to me that God is working through you. Blessings. Sandy congrats on 5 years! Really enjoy your videos! So inspiring and you are so talented! !